Half the people in the United States consume soda on any given day, according to the Harvard School of Public Health. Even though sugary drinks such as soda are connected to negative health consequences like obesity and dental problems, they remain the leading source of calories in the teenage diet. It doesn’t matter if you call it a “soft drink,” “pop,” or “cola,” the facts are the same: soda consumption is one of the most common dietary factors in tooth decay. Your teeth and gums are covered by a sticky layer of bacteria better known as “plaque.” Bacteria feed off sugar, which is plentiful in a can of soda. When bacteria come into contact with soda in the mouth, they start metabolizing the sugar and create acids as byproducts. These acids attack the tooth structure and enamel for at least 20 minutes, increasing your risk of tooth decay. Every time you take a sip of soda, this 20-minute acid attack starts over. Teenagers and children are especially vulnerable to the tooth decay caused by soda because their enamel is not yet fully developed. Most sodas contain phosphoric acid and citric acid, which are both highly damaging to your teeth. Acids can soften the enamel on the teeth, increasing the risk of cavities and tooth decay. Although drinking diet soda solves the problem of exposing your teeth to the damaging effects of sugar, diet sodas are still acidic, so they are not a safe choice. Researchers reported that the damage done to the tooth structure from excessive consumption of diet soda was similar to the damage caused by heavy drug use, says a study published in “General Dentistry” in 2013. It’s not only what you’re drinking, but how you’re drinking that may be a problem. 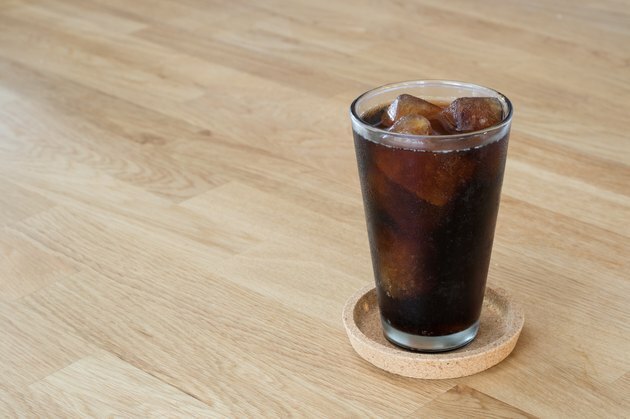 Holding soda in your mouth instead of quickly swallowing can cause the soda to become more acidic, leading to more damage, says a report in the “Journal of Zhejiang University Science” published in 2009. The effect is also greater as the temperature of the soda increases in your mouth. Soda is not just damaging to your teeth -- the sugar-laden beverage is also linked to obesity and the health problems that come with it. It’s best to remove soda from your diet completely and replace it with water; however, if that’s not in the cards, there are some things you can do to reduce the risk of damaging your teeth. Sip your soda through a straw to reduce the amount of contact it has with your teeth. After drinking soda, rinse your mouth out with water to remove the sugar and acids that are responsible for dental damage. Take it a step further by rinsing with fluoride mouthwash. Fluoride helps strengthen enamel and reduces the risk of cavities. Avoid brushing for at least an hour after drinking soda.